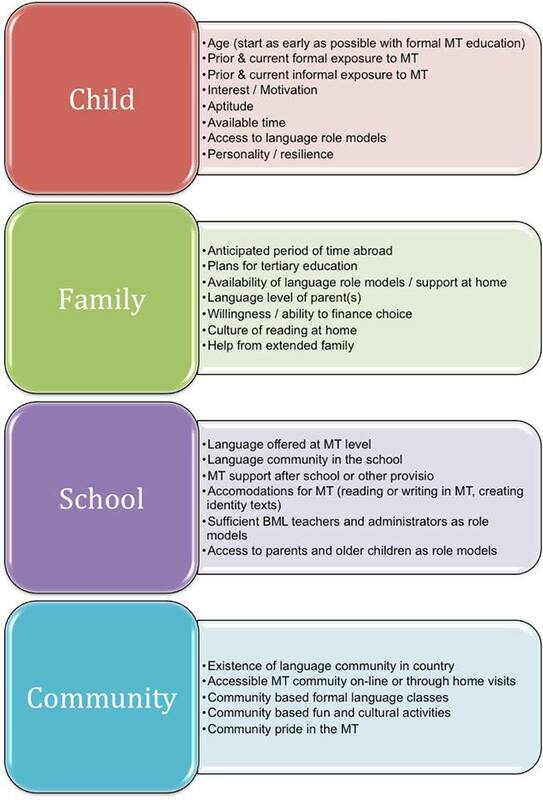 One of the things I did as part of my research was to summarise the factors that contributed to a family being able to teach and maintain their mother tongue in their children while living / being educated in an English dominant environment. First I present the table of factors, and then I present myself filling in this table as an exercise in my own home. Not much – Hong Kong is Cantonese not Mandarin speaking. Daughter did learn characters through observation on the street. Dutch spoken at home, exposure through paternal grandparents, aunts, uncles and cousins. 1 x 120 minutes after school tutoring. Yes – but needs prompting and encouragement as slow difficult process and access to the right leveled material is difficult. Yes, however she is not particularly a part of it. Administration & non-language teachers traditionally English / mono-lingual with some exceptions. This is changing a bit. In principal – but need to tap into this more. No formal structures. Yes, cultural events organized by Dutch Teacher. This work by Nadine Bailey is licensed under a Creative Commons Attribution-NonCommercial-ShareAlike 4.0 International License.